We all love to imagine that we will age gracefully but in reality, does that really happen? As years go by, tracks of time show up on our face with lines and sagging skin. Being someone who faces the camera almost every few days, I see my skin ageing year after year, and it looks especially obvious in photos. You would say, “No worries, you can always photoshop the lines away.” But, what happens when it comes to videos? I do not have the knowledge nor the equipment to erase the lines on my face in videos. Besides, I definitely want to look good in front of the camera, since I'm an influencer. 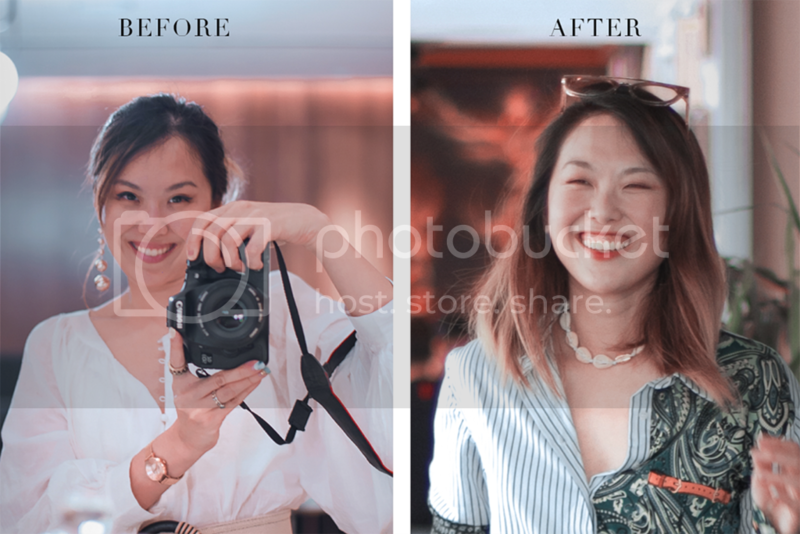 I heard about an instant facelift using “Silhouette Soft” face threadlift procedure, which is a minimally invasive, non-surgical face lift to lift the sagging skin on my chin and jowl area and help me regain my youthfulness. Reading about how good the results are, I immediately want to give threadlifting a try. 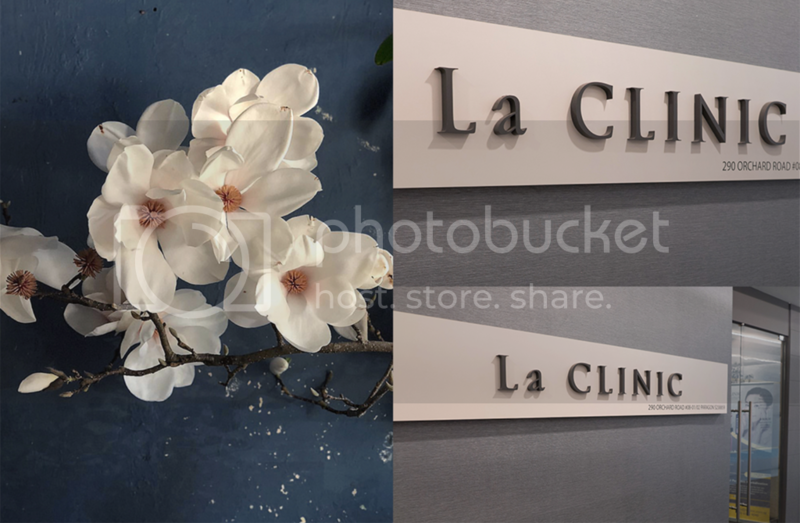 I am lucky to meet Dr Rachel Ho of La Clinic who has a wealth of experience using both the Silhouette Soft threads, Ultra V threads and Happy Lift threads for face and neck thread lifts. Dr Rachel has been trained under international surgeons, including the creator of Ultra V threads, Dr Kwon Han Jin from Seoul, Korea. It is extremely important to have an experienced doctor to perform facial threadlifts because the correct placement and vectors of the threads in the face will determine the outcome. The first step is to get a consultation with Dr Rachel who will help to do a detailed facial analysis, determining the type and number of threads required. I was told that since I’m still considered young (yup, I’m still under 40 years old), 2 threads are enough- one thread for each side of the face. For someone such as my mum, they will need at least 2- 3 threads to lift the skin. 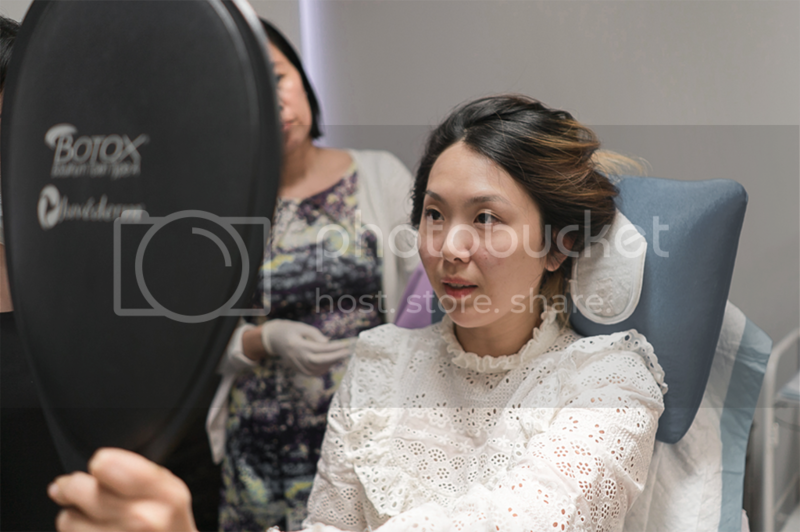 Dr Rachel is very patience and detailed in providing me with a background of the threadlift procedure and highlighting my problem areas, which are my nasolabial folds and my sagging cheeks. I told her I am extremely afraid of needles and pain so she said she will ensure the needles are out of my sight throughout the entire procedure. Threadlifts for the face and neck have been around for years and is the beauty treatment of choice for the rich and famous (Madonna is known to be amongst one of them). Fine threads are placed under the skin to lift the tissue, thereby correcting saggy and droopy tissues. There is no incision, scar or downtime, yet, the result can be as good as surgical facelifts. There are many different types of threadlift in the market. 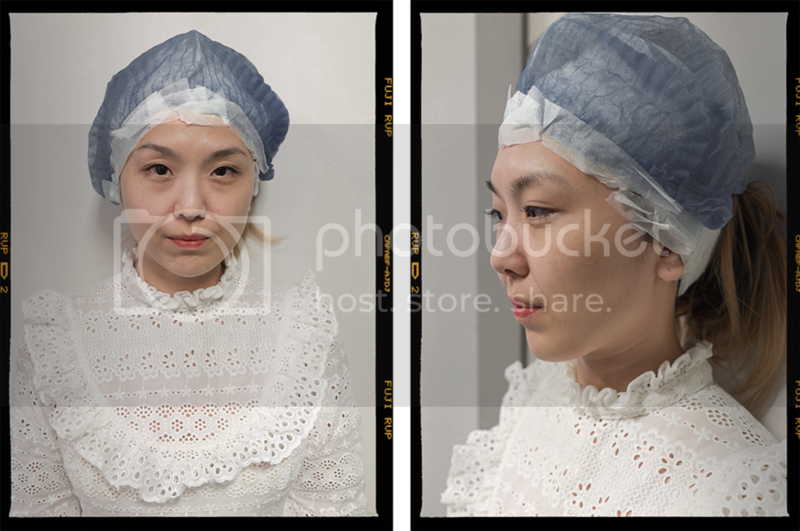 One of the first threadlift was developed in Korea and it uses many micro threads. Up to 400 insertions (ouch!) are inserted into the face to get the right lift and I'm glad the technique has been improved! Dr Rachel Ho recommend most of her patients to use Silhouette Soft which is a product from the USA for my face threadlift. This is because the Silhouette Soft threads achieve greater lift and stability with less number of thread required. 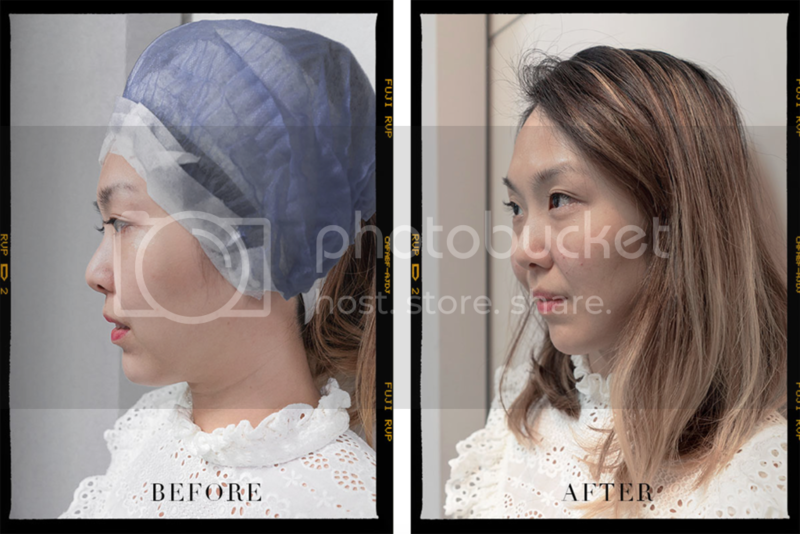 Silhouette Soft threadlift also last longer than threadlifts using threads from Korea. The difference between Silhouette Soft and Korean threadlift is its special mini cones on one long suture. These downwards pointing cones, provide traction and fixation points onto the facial tissue to keep the thread in place, thereby encouraging the build-up of new collagen formation. This action is what helps to restore shapeliness to the face and at the same time, cause inflammation beneath the skin to stimulate the production of collagen. The result from a threadlift are immediate and will continue to improve as the threads will encourage collagen growth and this will enhance the results of the threadlift. Poly L-lactic acid (PLLA) is the principal component of Silhouette Soft threads. It is a well-known polymer that has been used for many years in a number of biomedical and pharmaceutical applications: suture thread, orthopaedic pins, rods, screws and nails for bone fractures. Unlike many suspension sutures on the market today which originate from Asia, Silhouette Soft is made in the USA and is subject to numerous sanitary controls, thus, it is extremely safe. Since Silhouette Soft technique for the face threadlift uses a long suture and 2 long blunt cannulas as guidance, a minimum number of insertions are required. Thus, it's faster and less painful than the traditional Korean threadlift. The blunt cannulas are cut after guiding the threads into the face after the face threadlift. After inserting the suture, the doctor applies slight pressure on the treated area. This way, the doctor reshapes the contours of your face and makes it visibly smoother. The image above on the left is the actual Silhouette Soft suture that will be inserted into my face. The graphics next to it illustrates how the cones sit in the skin. 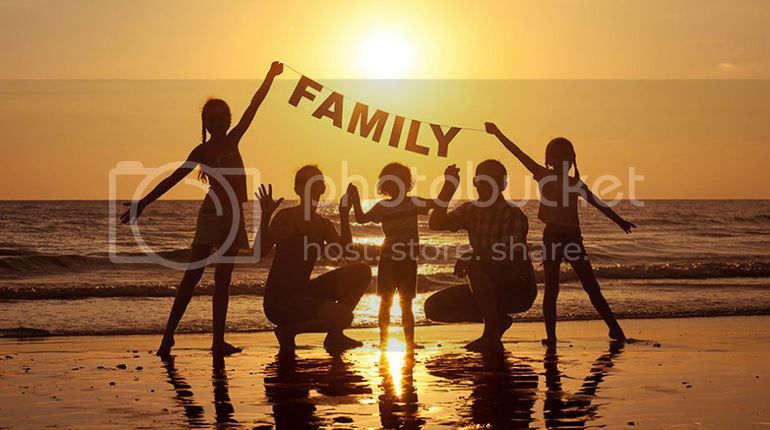 The entire procedure takes only around 30 minutes to complete. Although it's a very fast procedure, this is by no means a hit-it-and-quit-it lunchtime lift. There may be some swelling and bruising for a couple of days. My suggestion is to schedule the face threadlift on a Friday afternoon, so you'll be more-or-less presentable come the following work week. Silhouette Soft threadlift uses its unique cones to hold and lifts the skin. Only one entry and exit point required for each thread. The whole procedure takes only 30 minutes. There is no scaring, minimal downtime, and no general anaesthetic required. You can return to work immediately after the procedure if you don't mind having a slightly swollen face. Silhouette Soft is very safe for medical use. It made in the USA using Poly L-lactic acid (PLLA), a well-known polymer that has been used for many years as a suture thread, orthopaedic pins, rods, screws and nails for bone fractures. The threadlift effect will last around 18 months and during the period, new collagen is generated in the skin due to the friction caused by the cones. After that, a photo of my face before the threadlift procedure was taken so that we can compare the results after the procedure. (sorry I looked so terrible because I have no makeup on in this photo). My hair was all neatly tucked into the cap and taped down so that it will not get in the way during the procedure. 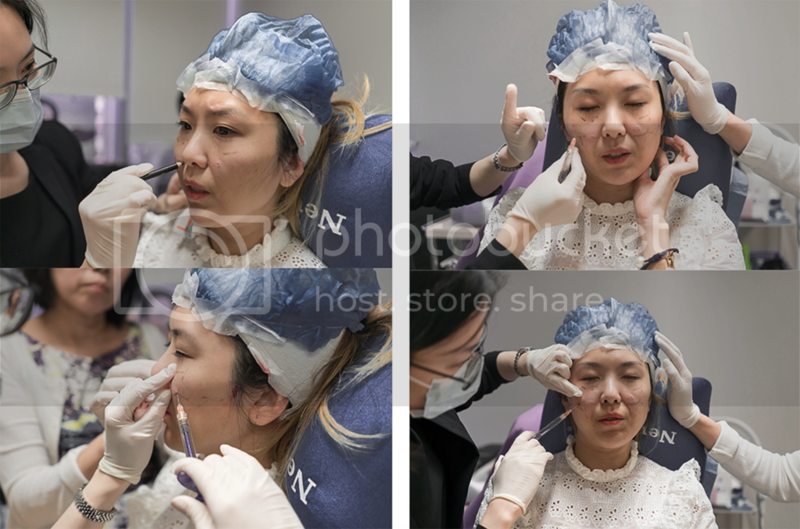 Dr Rachel Ho then marks the points where the insertion would go in and out of my face. Since I've already told Dr Rachel Ho how scared I am of needles, thus, she told me to close my eyes and think of happy thoughts. 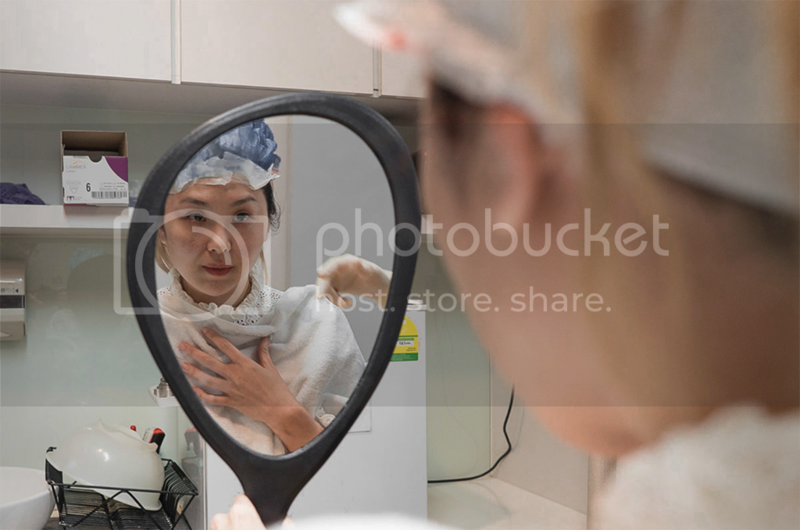 I was relieved to discover that the worst and most painful part of the entire face threadlift procedure was the injection of the local anaesthesia. (LA) As I requested for the procedure to be as painless as possible, Dr Rachel Ho kept asking if I felt any pain after the first few injections. Once I said I that I felt the pain, she stopped immediately and injected more LA for me, until I was totally numbed before she began the procedure again. I lay on the bed and the numbness starts to kick in. I could vaguely feel Dr Rachel Ho inserting the 30cm thread with the cones were attached into the centre of my cheek during the face threadlift. Although the face threadlift wasn't painful, there was a strange sensation because I felt like Frankenstein having my face sewn together. The thread was pulled taut at both ends so that the downward cones can be embedded into the subcutaneous fat and the upward cones nudged the facial tissues upwards. To be honest, I was totally terrified during the entire procedure (yes, I'm a scaredy cat), although I only felt a painless pulling on my skin. Dr Rachel Ho was really understanding and tried to talk to me about my interest such as travelling and praised me on my photo taking skills to make me feel better, and to distract me. I never opened my eyes throughout the entire procedure so that I won't be able to see blood or the needles. I am grateful that I was in the hands of an understanding and patient doctor who was willing to tolerate me being timid and afraid of the needles. In fact, I ever fainted while a nurse drew blood from me for a routine blood test. Therefore, I was so amazed that I could go through this entire procedure without blacking out, all thanks to a wonderful doctor. The whole process took just around 30 minutes, though it felt far longer since I was scaring myself so much. I was finally handed the mirror and I saw a much younger me! 10 years was taken off my face just within 30 minutes. I was very pleased with the results and the entire session was definitely worth it. Dr Rachel Ho wanted to minus off another 5 years off my face by adding some fillers into my cheeks. She used Juvederm Volift which was a very soft cheek filler to give a very natural effect. The photo below was taken immediately after the procedure. You can see a slight swelling and bruising on my face but my face was obviously much lifted and looked brighter. You can see that my jawline became more V-shaped as compared to the oval face I previously had. I was given anti-bruising medicine and antibiotics which I need to take for the next 5 days before my next follow session with Dr Rachel Ho. No makeup or extreme exercise was allowed for one week to avoid any chance of infection. It took about a few days for the bruising to fully subside, and after that, my colleagues commented asked if I went for a refreshing short vacay or I had a well-rested weekend. They commented that I looked so much fresher until I told them what I've done. The results from the threadliftis very natural, which is what I wanted. There is no drastic change to the face, but I looked brighter and more youthful. But once you compare the photos, you can see that the change is very obvious. 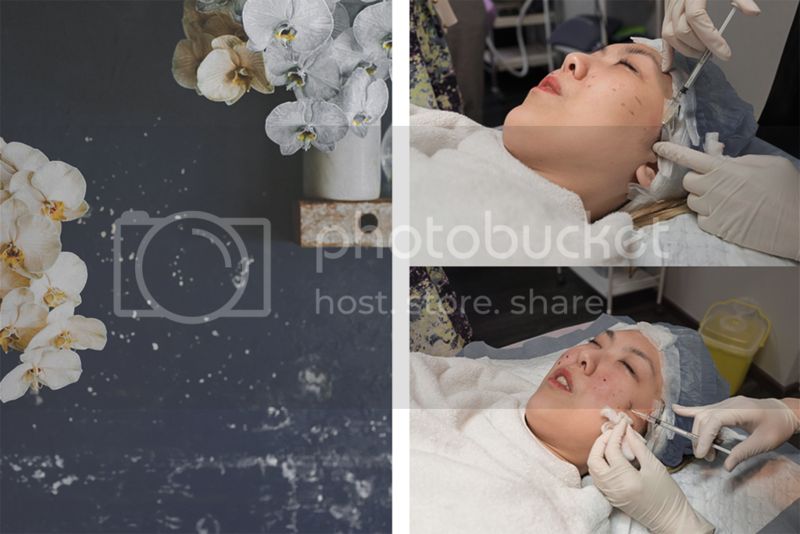 The left was taken in first week of October when I was in Malaysia, KL, while the photo on the right was taken 1.5 weeks after my thread lift session, which was third week of October. I was smiling so hard in the photo but there were lesser lines and I had a more youthful look. My eye bags are gone and my skin looks more bouncy. I was told that the effect will get even better over time as the skin starts to produce more and more collagen from the friction caused by the cones on the thread. If you are interested to try this instant face lift and look 10 years younger immediately, you can book a consultation session with the wonderful Dr Rachel Ho who will explain to you what will be most suitable for your face. Charges vary, but generally, one person will need at least 2 threads (one for each side of the face) and the cost will range from the low to mid 4 digits. 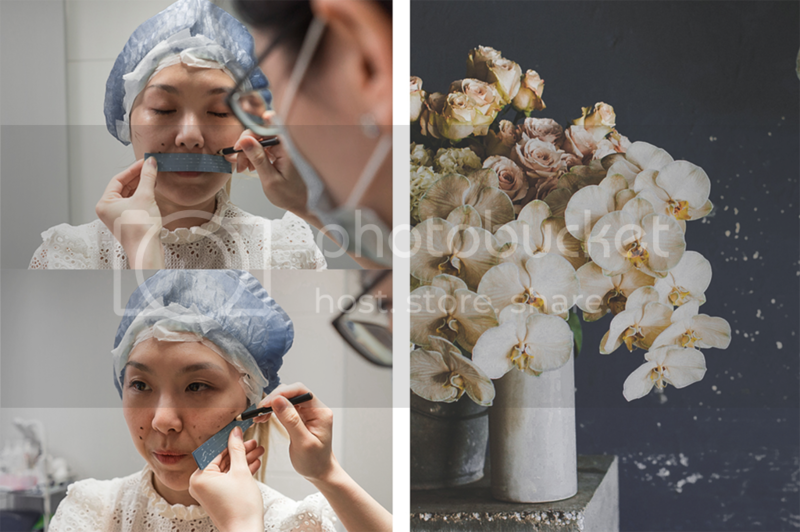 For more information about the Silhouette Soft face threadlift, Dr Rachel Ho has a detailed explanation on her blog. For further readings on cheek fillers, you can also read Dr Rachel Ho's post here. All flower images are by @mivioleta. 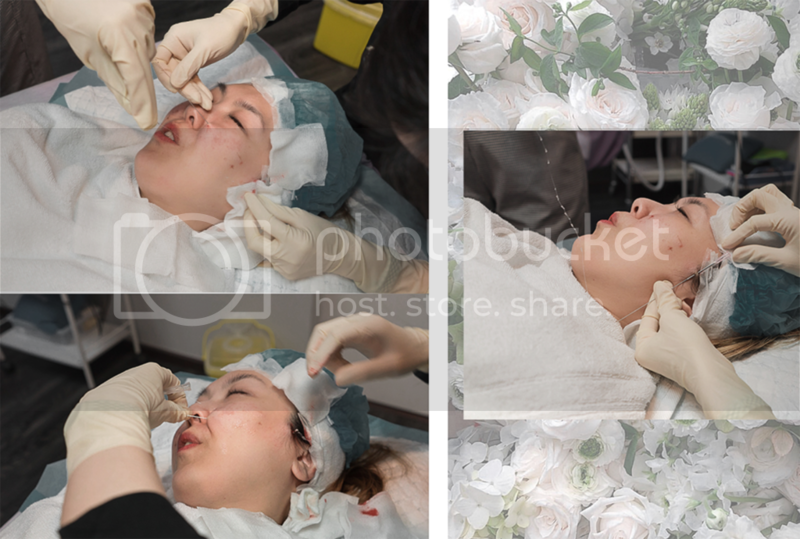 Thank you to MyFatPocket team for helping with the photos during the procedure.